Mystical, magical Zanzibar. 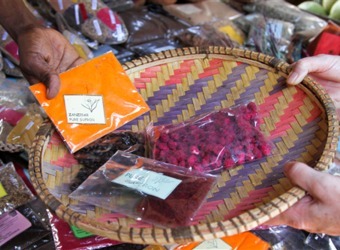 One of those fabled destinations that has long seduced travelers in search of an exotic escape. This island on East Africa’s Swahili Coast has attracted visitors for centuries, drawn to its exquisite white sand beaches edging the Indian Ocean, the winding alleys and merchants of old Stone Town, and its legendary spices. Explore Zanzibar’s collage of cultures and palm-fringed coast, for the perfect postlude to any safari. Zanzibar has something for everyone. 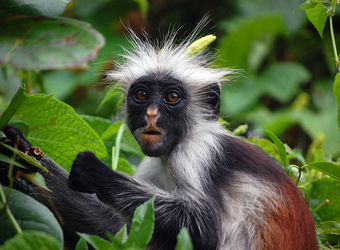 For the naturalist, Jozani Forest is Zanzibar’s only national park and is home to several endangered endemic species. The park borders Chwaka Bay, an important breeding ground for birds and open sea fish. The Chumbe Reef Sanctuary is a privately managed marine park harboring one of the last pristine coral reefs in the area, offering snorkeling and nature walks in the adjacent forest. Mnemba Atoll features pristine diving, snorkeling and fishing off the eastern shore. 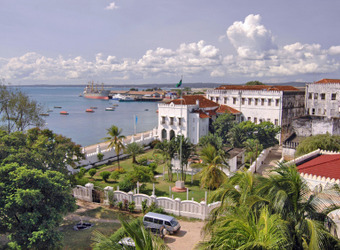 Stone Town’s historic center is a World Heritage Site, considered East Africa’s only functioning ancient town, famed for its significance in the spice trade and a showcase of Arab architecture, winding alleys, and some of the most beautiful and ornate carved doors in the world. 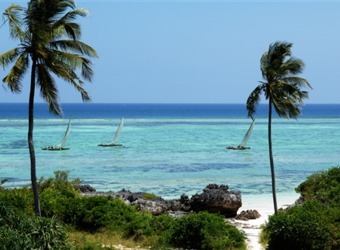 Of course, Zanzibar’s status as a tropical island means it also offers wonderful beaches, swimming in warm azure water, deep sea fishing, dhow sailing, snorkeling and diving. Jozani Forest shelters endemic and endangered species such as the Zanzibar red colobus monkey, which exists only on this island, the critically endangered Ader’s duiker, of which there are only about 1,400 remaining between Zanzibar and coastal Kenya, and the Zanzibar servaline genet, photographed here for the first time in 2003. More mysterious, the Zanzibar leopard is considered critically endangered and possibly extinct. The last reported sighting was in 2003. A total of 54 terrestrial mammals inhabit the island, including bush babies, bush-tailed mongoose and nocturnal Zanzibar tree hyrax. A great number of birds inhabit the island, including 40 species specific to the Jozani Forest, and there are many butterfly species on the island. Green and hawksbill sea turtles nest here, while offshore, dolphins are often sighted from land and sea. Zanzibar is an appealing extension to any Tanzania or Kenya safari and is easily accessible from Nairobi, Arusha and Dar es Salaam. It can easily be combined with the northern circuit of Tanzania: the elephants and baobabs of Tarangire, flamingos of Lake Manyara, menagerie of wildlife in the Ngorongoro Crater and large herds of the Serengeti. It’s an easy addition to western Tanzania’s remote Mahale and Katavi parks, as well as southern Tanzania’s Ruaha and Selous. In Kenya, safaris to see the elephants of Amboseli, the rhinos of Lewa and Laikipia, and the predators of the Maasai Mara can all be followed with the tropical wildlife and enticing beaches of Zanzibar. When did you visit Zanzibar?